Does your growing family make you realize you need to re-think your bathroom needs? Do you have mobility problems and long for a safe and secure bath? At Stile-It in Southampton, we’ve got you covered. Stile-It covers all your bathroom design and installation needs including tiling, wet rooms, underfloor heating, and bathroom refurbishing. At Stile-It, we can find a solution to your family’s requirements no matter what your budget. To start you on the way to your new bathroom, Stile-It will give you a free no obligation quotation. All our workmanship and products are guaranteed. Let us take the guess work out of your bathroom fitting. We start with your needs and your ideas and combine them into a luxurious design that is perfectly suited to your family. Our Southampton-based plumbers take the construction and installation from the beginning to the final immaculate detail. If bathing has become a safety concern for you, a wet room may be your answer. We can supply easy access showers for all levels of mobility that include grab rails and shower seats —all whilst maintaining your modern and stylish design. Walk-in baths are available with a range of safety features and in affordable prices. Stile-It provides full wall and floor tiling services for domestic and commercial properties. We have a wide selection of porcelains, ceramics, natural stone, and marbles to coordinate with your design and requirements. Our experienced plumbers make sure you receive 100% satisfaction whether we tile your kitchen, bathroom, or utility room. Upgrading to eco-friendly underfloor heating can be the best investment you make in your home. Not only is the initial cost of installation returned in reduced your monthly heating bills, you increase the re-sell value of your house. If you want to get that designer look without a complete overhaul, consider refurbishing your bathroom. A new look to your bathroom can be achieved with a little imagination from you and the know-how from Stile-It. With the rise in popularity of buy to let properties, refurbished bathrooms are a good way to invest whilst keeping the costs down. Stile-It supplies and fits showers, and installs and removes radiators and toilets. 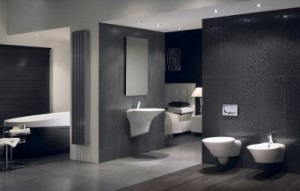 Stile-It is a family-owned business with more than 15 years of experience in bathroom fittings in Southampton. We will always give you great value at the best price. At Stile-It, we understand that reliability and a respectful attitude towards your property are important to you. Enjoy peace of mind with our 2-year workmanship guarantee and product guarantee of up to 5 years. If you have any problems following our bathroom fitting, a quick call and we’re there to ensure your satisfaction. At Stile-It, Peter and the team are always happy to answer your questions and make an appointment for your free no obligation quote. Give us a call on 02380 633966 or email info@stile-it.co.uk.